We are looking for Export Inquiries for Organic NPK from UAE, Russia, Egypt, Turkey, Srilanka and Vietnam. Organic NPK is a mixture of organic nitrogen, organic phosphorus and organic potash in the form of protein hydrolysates (amino acids) & gluconates/lactates. It contains readily bio-available organic form of N, P & K. Can easily be absorbed & assimilated into the plant system, thus very beneficial for the crops. 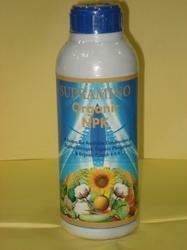 Supramino Organic NPK is a complete organic plant nutritional supplement. It supplements/substitutes NPK nutrients. Supramino Organic NPK takes care of Bio Enzymatic conversion of proteins for better & healthier crop growth. Supramino Organic NPK ensures NPK nutrients readily available to crops especially at vegitative phase, flowering, fruit setting phases. Supramino Organic NPK is compatible to almost all types o chemical pesticides, fertilizers, bio fertilizers / bio pesticides and can be mixed together while spraying. Supramino Organic NPK is neither toxic nor. harmful to the Floral/Fauna Environment. Supramino Organic NPK liquid may be used along with Supramino Amino Acids for foliar, drip fertigation applications for excellent results. Packaging Details: 1 LITER PACKED IN A HDPE BOTTLE, 10 SUCH BOTTLES PACKED IN A CARTON. 1360 CARTONS IN A 20' FT CONTAINER.